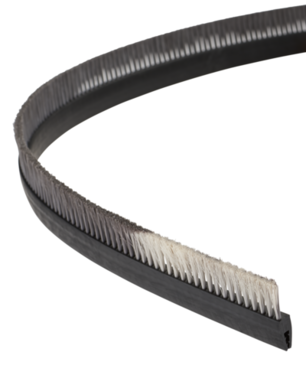 The Tanis Brush team can produce customized stapled set strip brushes to meet the unique needs of the market. Look at this case study to see how we accomplished this for one of our clients. Company Background: The customer is a global supplier of server cabinets used in data centers. They contract directly with end users, system integrators for custom designed cabinets, and offer distributors a standard line of cabinets and cabinet accessories. Challenge: They provide metal cabinets of various sizes that house a rack of data communication servers. If left uncooled, the temperature inside an enclosure of servers gradually increases to a critical point resulting in a shutdown of the data center. They needed to manage the cooled air flowing into the center of the cabinets. Assessment: The variety of cabinet sizes required a gasket that could be installed quickly and adapt seamlessly to the change in the dimensions needed for a proper air flow seal. A solid gasket failed to allow for cables and wire harnesses to pass through the gasket from one area inside the cabinet to another area of the cabinet. The Tanis Brush team designed a gripper style flexible backing to slide onto and secure tightly to the cabinet’s sheet metal. The matte black thermal plastic design matched the customer’s cabinet and made the gasket installation quick and easy. A tightly spaced two-row staggered pattern provided the seal and prevented cool air from escaping from the cabinet. Three overall lengths and trim heights covered 90% of the standard and custom cabinets. The thermal plastic backing enabled the customer to cut-to-fit when it was required. The filament allowed for a cable or wire harness to pass through from front to back where required without compromising the sealing capability of the brush. The clip styled stapled set strip brush provided the customer the flexibility they wanted without having to undertake a significant overall change of the cabinet design itself.